Concerned Citizens of Clean Ocean Action represent legions of volunteers and contributors who are concerned with ocean pollution. 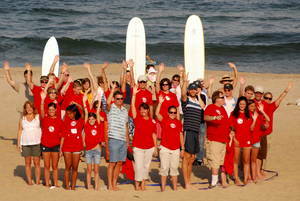 Organized in 1984, by the late Pamela Brinton, the group is touted as the "ocean's first line of defense." Today, Concerned Citizens are comprised of thousands of individuals, small and tall, who spread the word through letter writing; folding, stamping, and stuffing COA mailings; testifying at public hearings and attending rallies; staffing COA educational tables; cleaning beaches; and much more. Join Clean Ocean Action Today!